So exciting to have our first CSA deliveries for the season! We are a little earlier than some of our Farmer’s Markets, so we will be meeting at Rose’s Parking lot in Cumberland, on Thursday from 11:00- 1:00, and City Place parking lot in Frostburg, on Friday from 11:00-1:00. Our Bedford Market is starting on Wednesday from 9:00-1:00, and Wholesome Living Marketplace will be open until 5:00pm for those that need a later pick up time. Our Tuesday pickup at the farm will be from 10:00 am and all day long, we have a refrigerator in the greenhouse to keep things cool and fresh. 1. 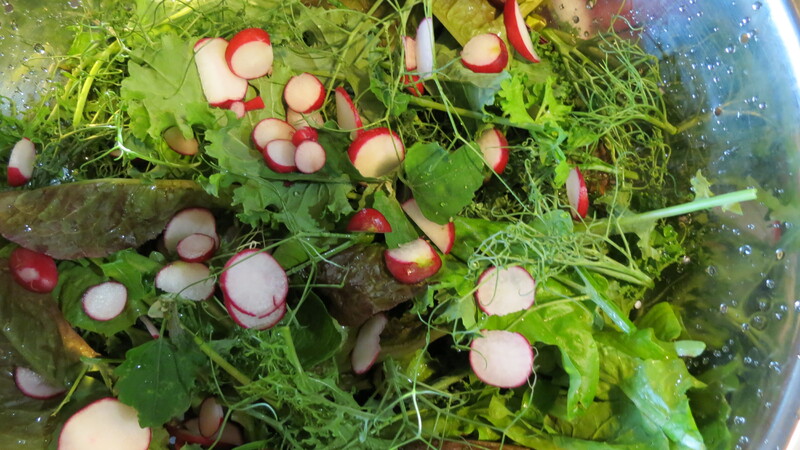 Wild and wonderful salad- blend of baby lettuces, mustard greens, arugula, pea tendrils, lamb’s quarters and sorrels. 8. Lilacs to make you smile till next week. Really exciting to get moving on the CSA’s thank you everyone for supporting local food in our community! Nice post, planted the tomatoes I got from you yesterday. Plus some red leaf lettuce. Basil ready yet? The Basil is ready, I have some set out to plant in our gardens too. You can come up anytime, or we will have them at the Cumberland Farmer’s Market on May 30th. I can’t wait to receive our first CSA box on Friday!